John McCain Wants to Be My Friend! So far 103 people are John McCain's friends on LinkedIn. I accepted, naturally, based on our close association in the US Navy--not withstanding the fact that he started at the US Naval Academy the year I was born and was just finishing his service when I was an E-5 attached to a recruiting command in Seattle attending school in the Nuclear Propulsion Program. I've pondered this invitation for the last few days wondering first if it was associated with the campaign at all and then what staffer took it in their head that LinkedIn was a good way to reach potential voters. 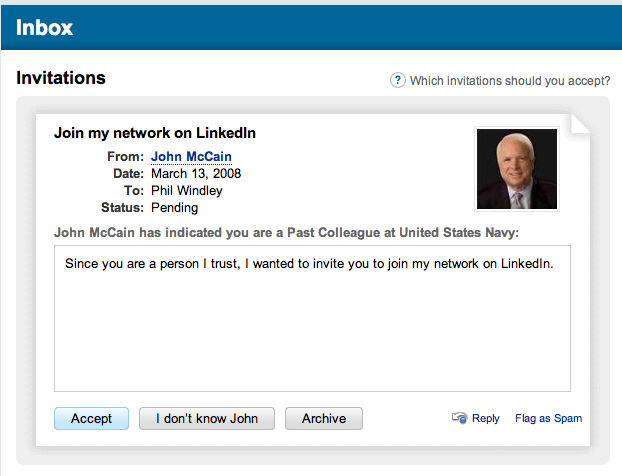 Many of McCain's links on LinkedIn have the Navy in their backgrounds, but not all. I'm looking forward to being able to tap into McCain's ties in the Senate to link to others and reach out to his network. :-) Not sure I see the strategy here.